MS Oranje, later known as MS Angelina Lauro, was a passenger liner, a wartime hospital ship and finally a cruise ship that was lost while being towed for scrap. She sank in a storm in the mid-Pacific, on September 24, 1979. The ship underwent 25 years’ service as MS Oranje, and fifteen as MS Angelina Lauro. She was a cruise ship for the last seven years of her career. Oranje was commissioned by the Nederlandsche Stoomvaart Maatschapij (Nederland Line / Netherland Line) and was built in Amsterdam, The Netherlands in 1938-1939 by the Netherlands Shipbuilding Company. She was launched by Queen Wilhelmina and named Oranje in honor of the Royal House of Orange on 8 September 1938. She undertook sea trials in June 1939 and attained a speed of 26 knots (48 km/h), making her the world’s fastest motor liner at the time. She was built to carry passengers to the Dutch East Indies. 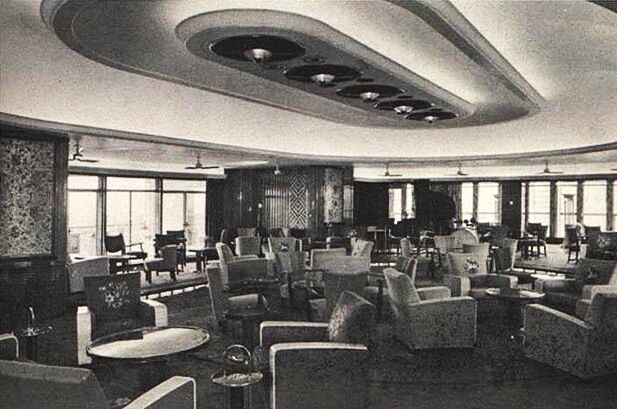 The Oranje’s first class lounge. Oranje’s first scheduled voyage was from Amsterdam to Jakarta (known at the time as Batavia) in Java, via the Cape of Good Hope. Three days before Oranje left Amsterdam on 4 September 1939, the Germans invaded Poland. By the time the ship arrived in Java the invasion had developed to the full-blown World War II, and due to security reasons. Oranje was laid up at Surabaya in Java from December 1939 until February 1941, at which point the ship’s Captain was ordered to sail for Sydney and place his vessel at the disposal of the Australian military. At the same time, the Dutch Government informed the Australian Government that they would bear the cost of Oranje’s conversion to a hospital ship. Although sailing under Australian command, Oranje remained crewed by a Dutch team and continued to sail under the Dutch flag. Oranje was the largest hospital ship operated from Australia, serving for five years throughout multiple theatres of World War II, including the Middle East, Indian and Pacific Campaigns. During this time, Oranje made 41 voyages, carrying Australian and New Zealander soldiers. After the war had ended, Oranje returned to her life as a passenger ship. In 1947, she recommenced the Amsterdam to Jakarta service, sailing via Southampton, England. On one voyage Oranje collided with her sister ship Johan van Oldenbarnevelt in the Red Sea, which was heading the opposite direction. Due to the possibility, she would be impounded for safety reasons, she was unable to call at Colombo as scheduled, and went directly to Jakarta. The service ended in 1957. The next year, in 1958, she made her first liner voyage from Amsterdam to Australia, sailing via Southampton, Suez in Egypt, and Singapore. She underwent a refit and a minor facelift in Amsterdam in 1959. 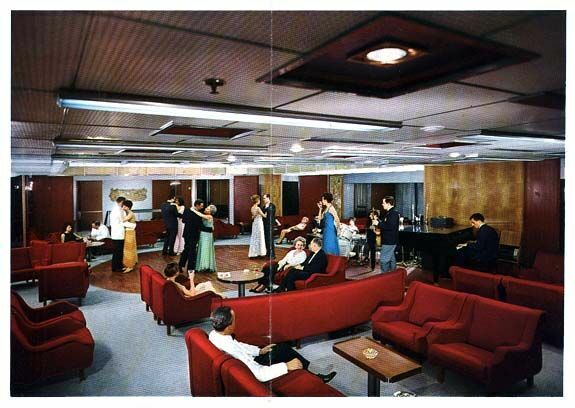 Upon completion, the tonnage was then listed as 20,565 GRT, and the ship was able to accommodate 323 First Class and 626 Tourist Class passengers. On 7 September 1960, she departed on her first round-the-world voyage from Amsterdam via Southampton, Suez, Singapore, Australia, New Zealand, Panama, Port Everglades, Bermuda, Southampton, and Amsterdam. Oranje and two other Dutch ships serviced Australia and New Zealand; the two other ships being the Netherland Line Johan van Oldenbarnevelt and the Royal Rotterdam Lloyd M.S. Willem Ruys. The three ships sailed under the banner of Dutch Mails. On 26 February 1961 Oranje sailed in the opposite direction, visiting the same ports. At this time, the passenger and cargo shipping industries were suffering from the growth of the airline industry. The increasing popularity of air travel, in particular with the advent of aviation’s jet era, led to the sharp decline in ship passenger and cargo numbers. As a result, the Netherland Line decided to end its passenger services in 1964. 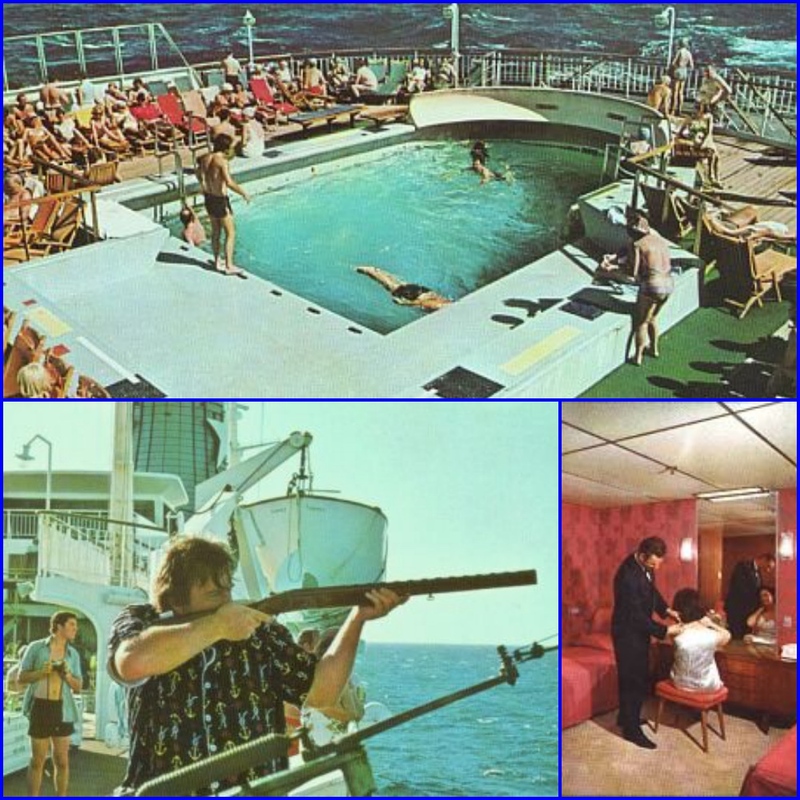 Oranje commenced its last voyage around the world as a Dutch liner on 4 May 1964. 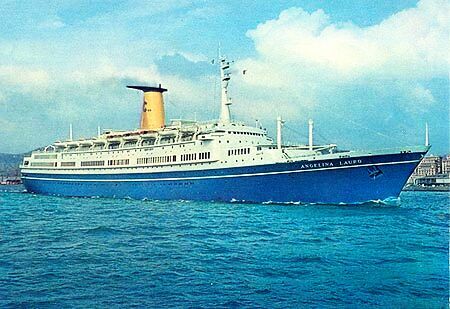 The Netherland Line sold their flagship, Oranje, together with its Royal Rotterdam Lloyd running mate Willem Ruys to the Italian company Flotta Lauro, also called StarLauro, later in 1964. The ships were rebuilt and renamed Angelina Lauro and Achille Lauro, respectively. Oranje was sent to Genoa to be extensively rebuilt at the Cant del Tirreno shipyards. On 24 August while she was being rebuilt a fire broke out in which six people died. The rebuild extended the promenade deck, and it was fully glazed in. The ship was also given a sharply raked bow which extended its length by 16 feet (4.9 m). The other outstanding feature was the tall louvered funnel topped by a large smoke deflector wing. The interiors were also transformed. After the rebuilding was complete, Angelina Lauro was then listed as 24,377 GRT, 205.5 meters (672.4 ft) long and 25.5 meters (83.6 ft) wide. The new passenger configuration allowed for interchange cabins between first and tourist class. First Class could accommodate between 180 and 377 passengers and Tourist Class between 946 to 1050 passengers, making a total of 1230 passengers. On 6 March 1966, the ship departed on its maiden voyage from Bremerhaven sailing via the Suez Canal to Australia. It continued on the Australian service until 1972, when Flotta Lauro discontinued the service due to low passenger numbers as experienced by all shipping companies at the time. 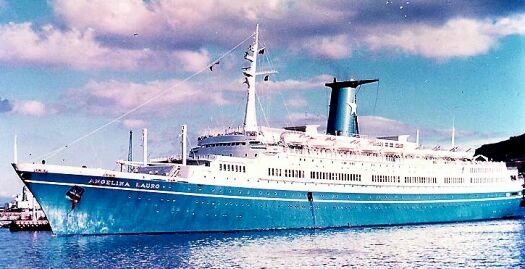 In 1972 Angelina Lauro received an extensive refit to ready it for a new role as a full-time cruise ship. 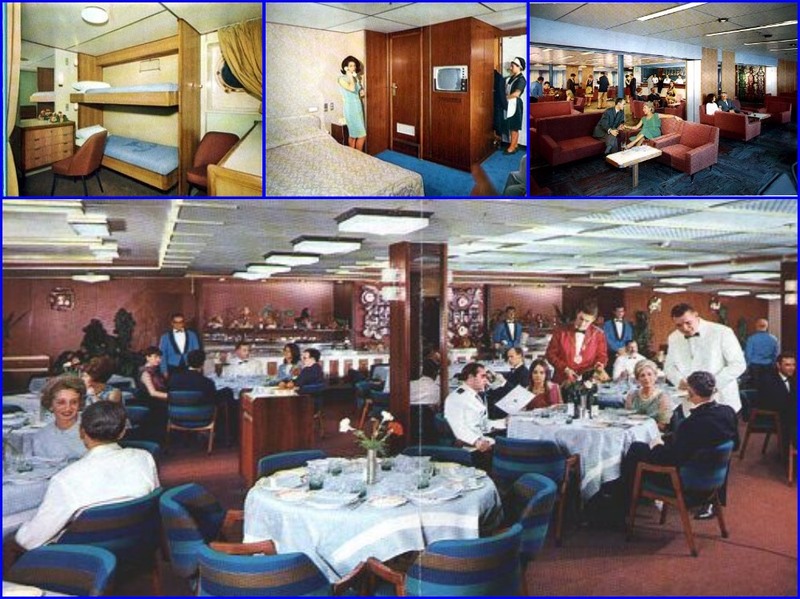 After the refit, it accommodated 800 passengers in a one class configuration. 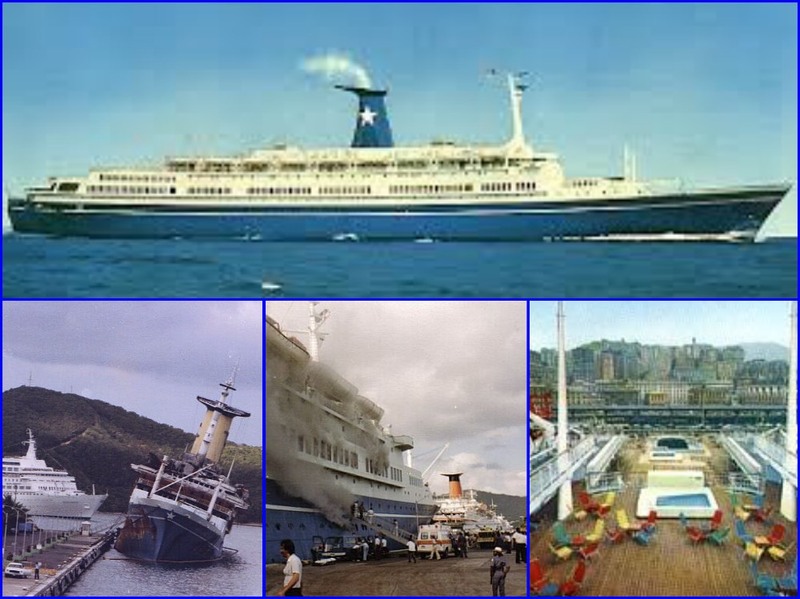 It was relocated to San Juan for regular cruises of the Caribbean but was managed by another Italian shipping company, Costa Lines. In 1977 Angelina Lauro was chartered to Costa Lines for three years. The company took delivery on 1O October. The ship was based at Port Everglades for cruise duties in the Caribbean. 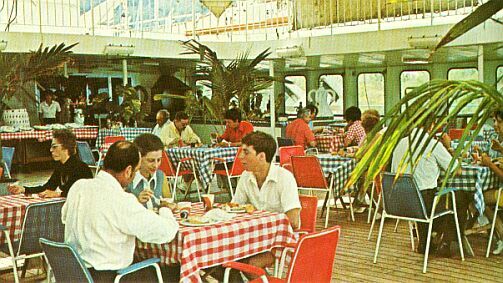 Although the ship retained its name, Costa Lines according to their custom of using Christian (first or given) names, marketed the Angelina Lauro simply as Angelina. After this time, occasionally Angelina Lauro would operate a line voyage across the Atlantic from South America to Italy. For these line voyages, it reverted to its original two-class configuration. 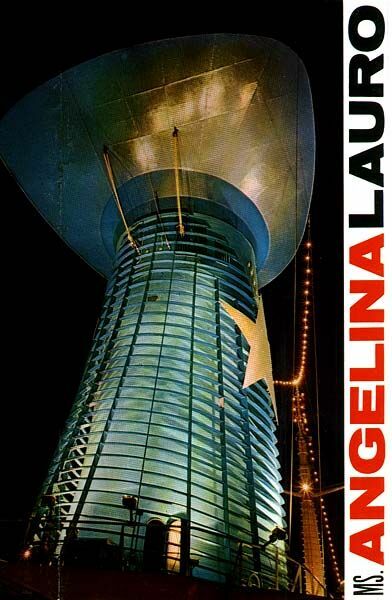 Angelina Lauro was a popular cruise ship in the Caribbean until 30 March 1979 when tragedy struck. It suffered a devastating fire (eyewitness account) while on a cruise and berthed at Charlotte Amalie, St. Thomas, United States Virgin Islands. 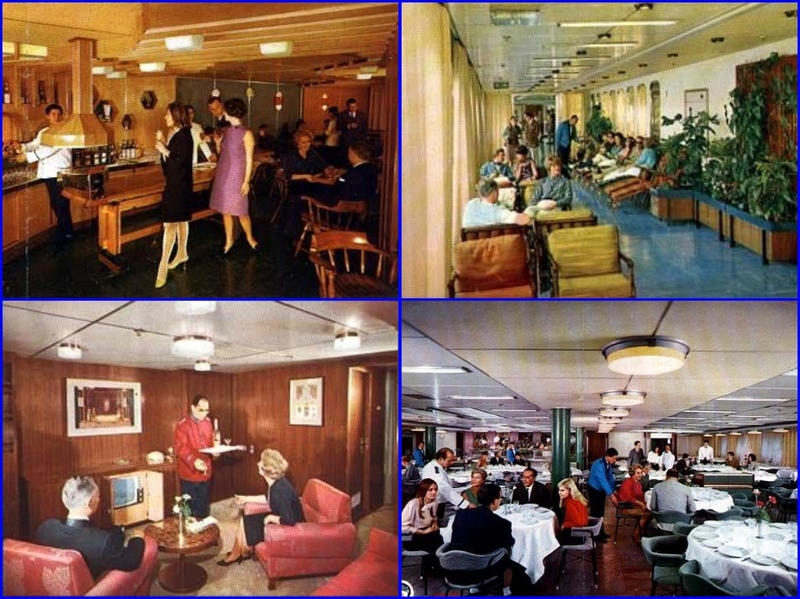 The fire broke out in the aft crew galley and rapidly spread forward through the restaurants and passenger accommodations. Even though the well-trained crew did everything possible to contain the fire, the task was too great, and soon flames had reached the top decks. Most of the passengers and crew were ashore when the fire broke out, and all those on board were evacuated safely. It took four days for port firefighters to put the fire out, during which time onshore firefighters joined the battle. Some attempts were made to tow the ship away from the wharf; however, this failed due to the weight of the water that had been pumped into it. Slowly it ended up sitting on the shallow bottom with a list to port. It was very fortunate that no-one was killed during this incident. Angelina Lauro was declared to be a total loss and remained dockside for some three months. Eventually, the German salvage company Eckhardt & Company of Hamburg was awarded the contract to raise it from the bottom and have it refloated. This was achieved on 2 July 1979. Lauro Cruises decided to sell the ship for scrap to Taiwanese ship breakers, and it departed under tow for Asia on 30 July. Angelina Lauro successfully navigated the Panama Canal and was headed across the Pacific towards Taiwan. However, on 21 September, in the mid-Pacific, M.S. Angelina Lauro’s fire-affected warped hull plates began to take on water, and it began to list slowly. The ship remained afloat for three days, but by the evening of 23 September, it was fully on her side. It was not until early the next morning, just before sunrise, that it slowly sank. It was twenty days after the ship’s 40-year milestone. Angelina Lauro’s former running mate Achille Lauro (formerly named MS Willem Ruys), which became well-known for the terrorist attack in Egypt, continued cruising until November 1994, when she caught fire and sank on 2 December 1994. 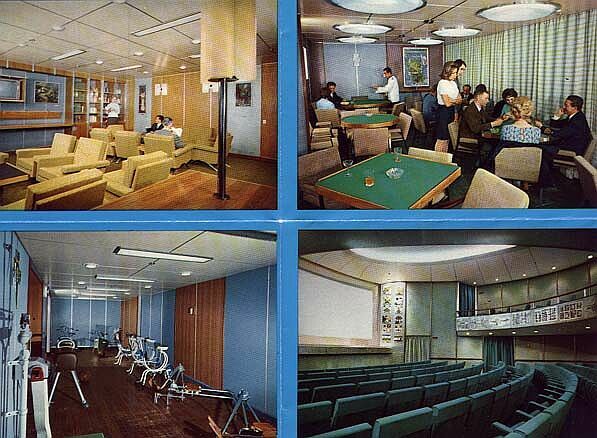 Visit SS MARITIME for full information and background on this wonderful liner of the past. Previous: CHASEN’S – The world-famous West Hollywood Celebrity restaurant. No credit cards, please! Next: PART 2 – 71 years ago – SS LURLINE sailed on her post WW 2 voyage to HAWAII from CALIFORNIA.